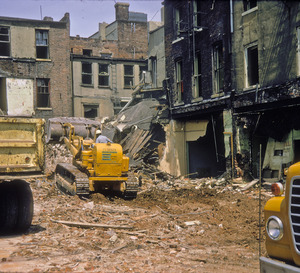 Behind view of buildings being demolished during the urban renewal project in Iowa City. Future site of Old Capitol Mall. Lindley, Theo, “Behind View Building Debris, Corner of East Washington and South Clinton Streets, 1970-1976,” Iowa City Public Library, accessed April 19, 2019, http://history.icpl.org/items/show/321.